The Eagles are back as defending Super Bowl champs and ready to make themselves heard in the NFC. Philadelphia has their eyes set on winning the NFC East and to bring another Super Bowl title to the city of brotherly love. Led by a high powered offense, the Eagles look to beat out the Pittsburgh Steelers for state bragging rights and overcome division rivals the Dallas Cowboys and the New York Giants for the East title. Grab your Philadelphia Eagles tickets and head over to Lincoln Financial Field to be a part of your team’s home field advantage. While 2016’s rocky start left Eagle fans with mixed feelings, the 2017 season was historic. The Eagles beat the New England Patriots in Super Bowl LII 41-33, winning their first ever Super Bowl title in franchise history. It was a game that Philly fans will remember forever. January 19, 2002: NFC Divisional Round – This game saw two of the strongest defenses of the year pitched against one another. The Eagles and the Chicago Bears went neck-to-neck in front of Chicago’s home crowd at Soldier Field. If there was any intimidation, the Eagles did not succumb to it. Hugh Douglas, in particular, knocked QB Jim Miller down with a dislocated shoulder. This injury totally caught the Bears by surprise who could not recover in Miller’s absence. The Eagles won the game 33-19. Eagles’ Decade of Dominance – A singe onside kick in Dallas became the crucial ingredient for ten years of success for Philly. Head coach Andy Reid maneuvered a fate-turning onside kick against the Cowboys in their hometown which caught the host team off guard. Troy Aikman was knocked out during the first quarter and the Eagles won comfortably 41-14. Duce Staley deserves an honorable mention in this game for his 201 rushing yards. Era of Jeff Garcia, 2006 – 2006 was a good year for the Eagles. It began with Philly being one of the best NFL teams, with four out of five wins. However, unexpectedly Donovan McNabb’s tore his ACL possibly endangering the Eagles’ season. Head coach Andy Reid however, had different ideas and replaced McNabb with Jeff Garcia. This proved to be a good choice as Garcia played an instrumental role in the next four victories for Philly, three of which were consecutive. He was responsible for an amazing comeback against the New York Giants and Carolina Panthers during the season resulting in a wildcard win for the Eagles. Dallas Cowboys – The Eagles and the Dallas Cowboys have been rivals on and off the field. With loyal fans on both sides, the temperature of this rivalry can be detected from Cowboy Eagles games in the 1960’s. It began with a Dallas win by an astonishing lead of 56-7 in their hometown. The Eagles felt this loss deeply, and then-coach Joe Kuharich would show the team footage from this game to motivate them. Surely, it came in the shape of a rematch a month later, where the Eagles won with a close 24-23, shocking both the Cowboys and their fans. New York Giants – The New York Giants and Eagles faced off in the Eastern Conference Championship during 1960 where Philly led 17-10 while the Giants struggled to keep up. Since then, these two team’s on-field rivalry has become one of the most anticipated in the NFL. The most notable Philadelphia Eagles player has got to be David Akers. An undisputed leader, Akers has scored over 1300 points which beats the second highest point-scorer, Bobby Walston, by over 400 points. Walston was an impressive kicker and receiver in his own right. He scored eleven touchdowns during the 1954 season alone and scored 881 points during his nine years with the Eagles. Harold Carmichael was another impressive wide receiver who turned out to be a game-changer for the Eagles. Standing at 6’8”, he was taller than the standard wide receiver. However, his size gave him a one up over other team’s cornerbacks, and put him down as one of Philly’s greatest wide receivers. He played the Pro Bowl an impressive four times and entirely changed the standards for wide receivers in the NFL. The Philadelphia Eagles are all set for NFL’s 2010 season. From August 2018, they can be seen in stadiums away-from-home and in their hometown’s Lincoln Financial Field as well. This stadium is the official home for the Eagles and is one of the ideal locations to witness some of the best games of the season. As far as the Philadelphia Eagles home stadium goes, two-thirds of the seats in the stadium are on the sidelines, so there is practically no bad seat in the house. Lincoln Financial Field also provides fans with massive plaza filled with activities, food trucks, face-painting, vendors, games, and a tent with a band performing Top 40 hits. Lincoln Financial Field is the ideal location for Eagles fans to catch their favorite team. Philadelphia Eagles Tickets 2018 for their season games are on sale now. Our process for purchasing cheap Philadelphia Eagles tickets is simple and fast. There are so many online ticketing sites, that it can be hard for customers to find the right place to buy Philadelphia Eagles tickets at the cheapest price. At ScoreBig we think of our customers first and foremost. We offer daily deals for Philadelphia Eagles events, so our customers can get the best seats for the best prices. ScoreBig will always go above and beyond to offer the cheapest Philadelphia Eagles tickets on the market. The Philadelphia Eagles schedule above, displays all available events for 2019 and 2020. Once you find the event that you would like to go to, click the red “Get Tickets” button. It is located on the right-hand side of the event listing, it will take you to an Philadelphia Eagles event ticket page. ScoreBig's event ticket page will display all available Philadelphia Eagles tickets for that event. On the event ticket page to help with your search for the right Philadelphia Eagles tickets, use the filters at the top to select quantity, price range, and more. There is also an interactive seating chart so you can pick where you want to sit. When you are ready to buy a ticket, click on the listing, and you will be directed to ScoreBig's checkout page. Upon completion of the information fields, your order will be processed and your Philadelphia Eagles tickets will be delivered via email, mail, or to your mobile device. What makes ScoreBig’s site stand out from the rest? We are constantly analyzing our competitors to improve our site, service, and prices. ScoreBig.com employees strive to offer the best process and experience to buy cheap Philadelphia Eagles tickets. Our goal is to get you the best seats to Philadelphia Eagles events. We offer daily discounts on our site and for special promotions check out our newsletter. If there are no Philadelphia Eagles events currently available, you can use our search feature at the top of the page to see a list of all popular events going on near you. No matter your price point, we have all the best deals and discounts on Philadelphia Eagles tickets. For more information on prices of Philadelphia Eagles tickets and the schedule for Philadelphia Eagles, check out our listings above. The last thing you want to find out is when the Philadelphia Eagles event you wanted to go to is sold-out. Don’t worry in many cases ScoreBig has affordable tickets to sold out events. We sell tickets from GA all the way to premium seating and parking. Skip the scalpers in the parking lot and get your tickets online from top Philadelphia Eagles ticket brokers. We get you in all events, buy your Philadelphia Eagles tickets here from a brand that many trust and rely on for all their ticketing needs. ScoreBig offers a 100% money-back guarantee. If you have been in search of cheap tickets for Philadelphia Eagles, ScoreBig by far is the best option. That’s why ScoreBig has more loyal customers than any other ticketing site. 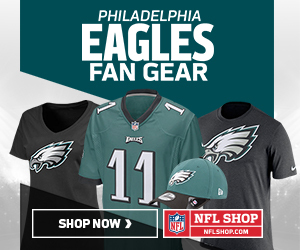 Shop at ScoreBig for safe and secure Philadelphia Eagles event tickets.